Spider-Man comes to the rescue in firefighter gear! Pay homage to New York's Bravest with this Minimates 2-pack! As one of New York City's resident superheroes, Spider-Man sees a lot of fires, and puts his strength, agility and Spider-Sense to good use rescuing anyone who might be trapped inside the burning building. But the real heroes are the men and women who do the same thing every day, without the benefit of a radioactive spider-bite. They may not be able to scale walls without a ladder, or break down a door without an axe, but the firefighters of NYC have truly earned the name "New York's Bravest." 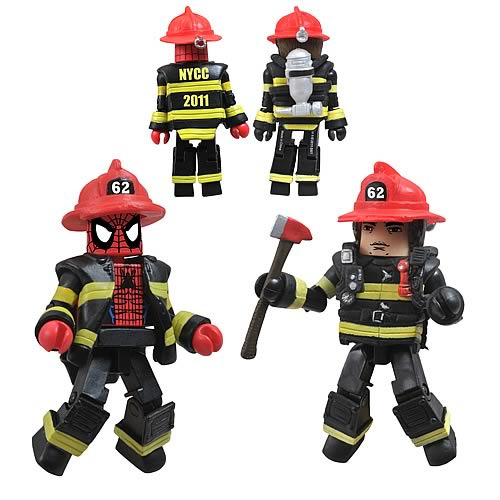 This two-pack of 2-inch Minimates mini-figures pairs Firefighter Spidey with an NYC Fireman, and includes an axe, a flashlight, and various interchangeable parts. Limited edition of only 3,000 pieces! Ages 8 and up.